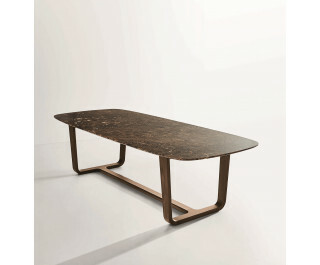 The legs, which are available in American walnut-wood or in natural polished or grey ash-wood, follow a silhouette consisting of lines and connections: indeed, they are connected by a central longitudinal element which facilitates the volumetric perception of the table. The outline of the table top stems from the merger of two geometric shapes, namely the rectangle and the oval, giving rise to a new and original shape. Deliberately in contrast with the solid wood legs, the table top is available in marble (Calacatta, Carrara, Marquinia or Emperador), lacquered white, acid-treated glass or ceramic.